Photo courtesy of http://www.elodea.co.uk. 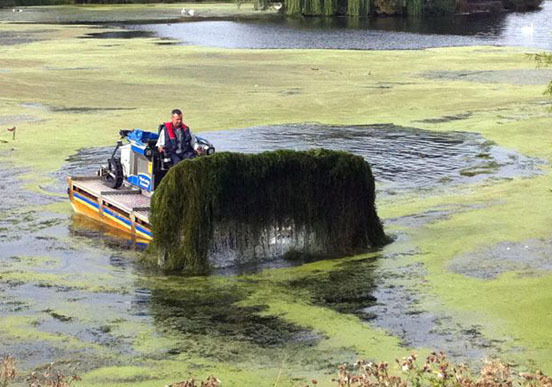 Attempts to remove elodea from a lake in the United Kingdom. The plant was discovered on the Kenai Peninsula last year. Hearing about invasive terrestrial plants is, unfortunately, getting to be routine on the central Kenai Peninsula, as residents are asked year after year to do their part to prevent invasives, such as dandelions, bird vetch and purple loosestrife, from spreading across the land. Now a newly discovered invader — the first submerged aquatic — has upped the alarm in necessity of response, as it’s one that can cause so much damage, so quickly, that biologists are asking for everyone’s help to immediately start combating its spread. “This is a really bad one. This is the one we were worried about because it could hurt the fisheries of the entire peninsula. It’s a really big deal,” said John Morton, supervisory wildlife biologist with the Kenai National Wildlife Refuge. The aquatic invader is known as “elodea” and has recently been discovered in Stormy and Daniels lakes in Nikiski, as well as some slow-moving waters in other parts of the state, including Anchorage, Fairbanks and Cordova. Added to its ability to spread from a tiny piece, the plant also thrives in cool water conditions, and even continues to grow under the ice in winter. In the Lower 48 and in Europe, elodea outbreaks have gotten so thick that the growth has to be mechanically mowed with specialized equipment, or removed by backhoe as part of the eradication process. Photos courtesy of the Kenai National Wildlife Refuge. A crew from Fish and Game, U.S. 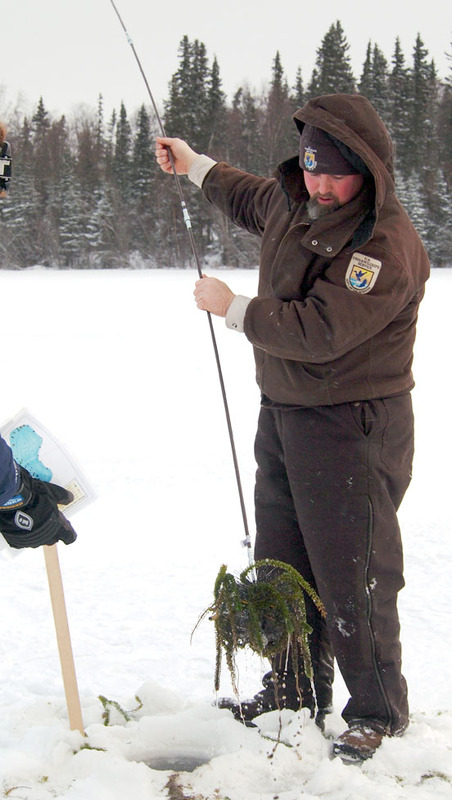 Fish and Wildlife Service Kenai Fisheries Office and the Kenai National Refuge cut holes in the ice covering Daniels Lake last week to test for the presence of elodea and map how far it has spread. “It grows so abundantly that it literally shuts down the ability to run a boat motor through it. It’ll foul floatplane rudders and boat props. It’ll foul launch sites and shore habitats, and it degrades salmon spawning habitat,” said Libby Bella, a refuge ecologist. “So it’s not just ecological damage, but economic damage that can happen from it radically changing habitat,” Bella added. It’s unclear how elodea came to be present in central peninsula lakes. Bella said that, for several years, the plant was a staple part of science kits sold to biology classes around the state. It was also sold regularly at pet stores as a common aquarium plant. A test hole cut into Daniels Lake in Nikiski last week reveals bad news — the presence of the invasive, quickly spreading elodea plant. It reproduces asexually, thrives in cold water and spreads rapidly. Morton said that, while it is unfortunate elodea was found on the Kenai Peninsula at all, how it was found was quite serendipitous, since biologists stumbled on it while focusing on an entirely different invasive species. Toby Burke, with the refuge, readies a submersible camera that will be lowered into the lake to search for elodea. Game, Department of Natural Resources, U.S. Fish and Wildlife Service, University of Alaska Fairbanks Cooperative Extension Service, Cook Inlet Aquaculture Association, Homer Soil and Water Conservation District, Kenai Watershed Forum and the Kenai Peninsula Cooperative Weed Management Area. 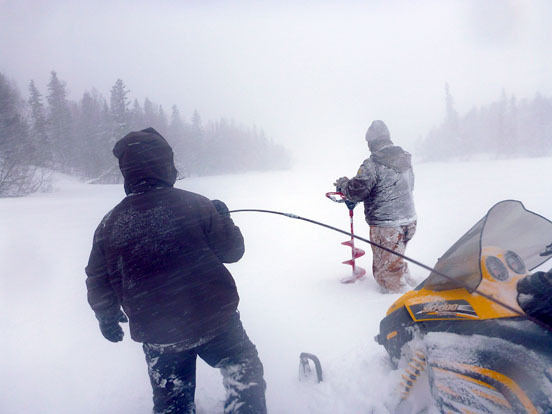 Fish and Game surveyed the distribution of elodea in Stormy Lake by sampling with a “rake” made from a modified chimney brush that, when submerged, collects elodea if present. From the 150 rake throws conducted from around the entire circumference of the lake, elodea was determined to be present in roughly 20 percent of the throws, and mostly at depths of 7 to 9 feet, Morton said. In October, Fish and Game, joined by employees of the U.S. Fish and Wildlife Service Kenai Fisheries Office, conducted a less formal survey of nine other lakes: Salamatof, Longmere, Island, Sport, Scout, West Mackey, East Mackey, Wik and Daniels. “A single strand of elodea was detected in Daniels Lake at that time,” Morton said. 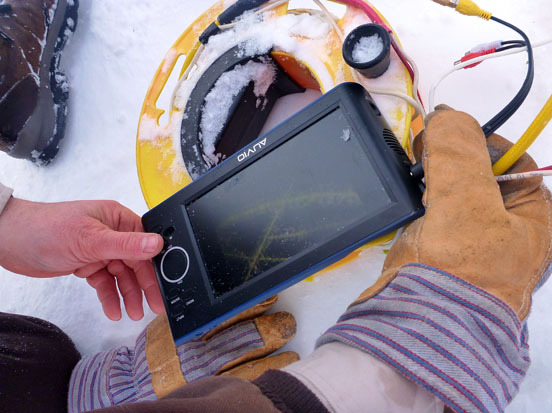 A remote camera transmits images of elodea to a handheld unit. 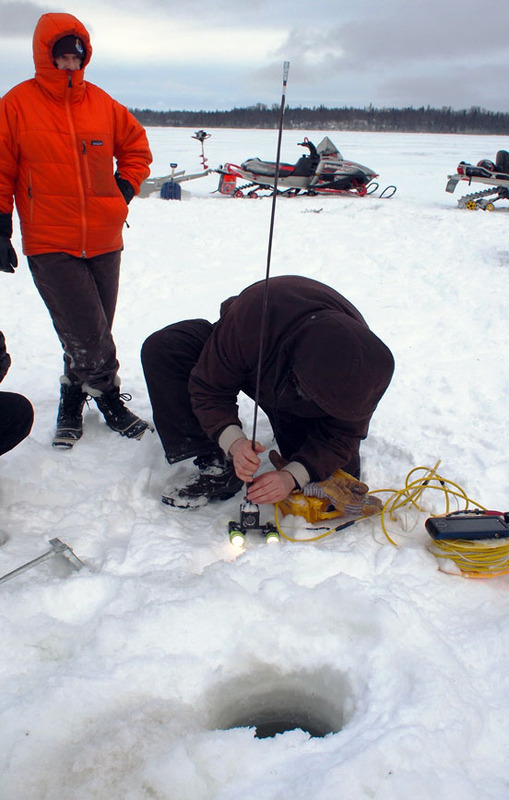 To determine how widespread elodea was at this locale, last week the staff from multiple agencies took to Daniels Lake to collect samples, the first through-the-ice sampling for invasive aquatics conducted in Alaska. They auguered through the ice at 25 sites — three holes per site — distributed systematically around the 10-mile perimeter. “Elodea was detected at two sites adjacent to each other on the southern shore,” Morton said. More startling than its presence was how well it was doing under the thick ice. “When we augered the hole and water splashed out, the elodea splashed out with it, vibrant and green. There was essentially no dieback in winter,” he said. 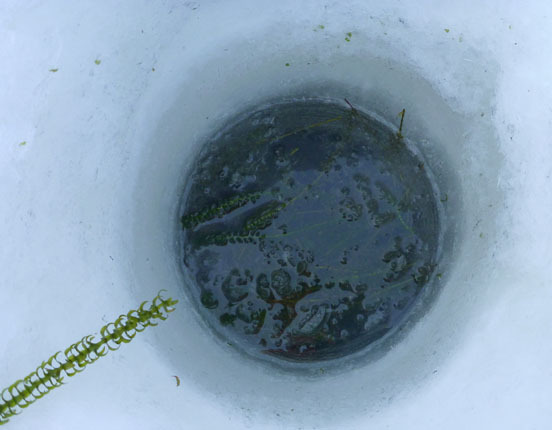 Toby Burke pulls up a brush loaded with snagged elodea from beneath the ice. Despite that, elodea has only been detected in two local lakes — one of which is in the refuge. Morton said that knowing how quickly and easily it could spread and choke out other bodies of water around the Kenai Peninsula is what has biologists from multiple agencies scrambling to take action against the aquatic intruder. “What’s driving us is we’re running out of time to do something proactive. We need to do something this summer because the stakes are so high. Each summer that goes by that we don’t treat it, we risk it being spread, which will just make it more difficult and expensive to treat when we do finally commit to eradication,” Morton said. There are multiple approaches that could be taken to eradication, depending on the size of the outbreak. Elodea in other areas has been treated with underwater vacuums and herbicides, but the latter of these can get expensive. Depending on the chemicals used, herbicides can cost as much as $750 per surface acre, and there are roughly 10,000 surface acres between Stormy and Daniels lakes, Morton said. 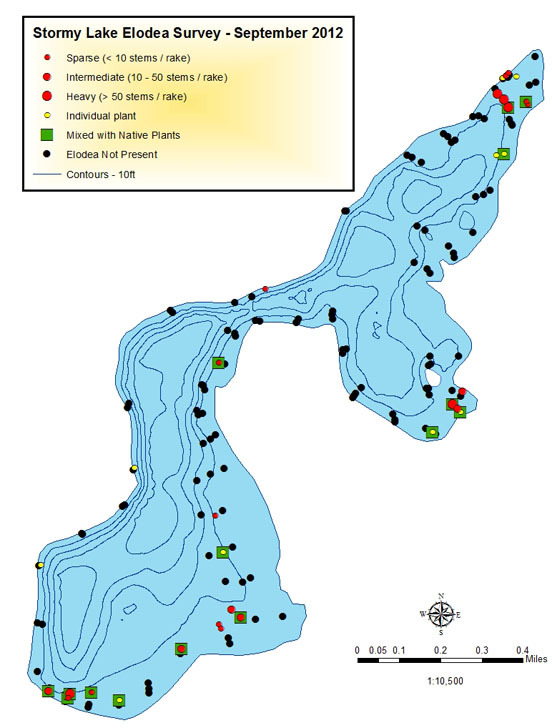 A map documents the spread of elodea in Stormy Lake in September 2012. Adding to the situation, while Stormy Lake is located on the refuge, Daniels Lake is not, and has roughly 136 private landowners who will all need to be informed of the situation and be allowed to give input into any planned elodea-eradication process. “We want stakeholder participation. We want people to know how bad this could be so that eradication can be done,” Morton said. To begin informing the public about ways to minimize the spread of elodea, and to gather information on the community’s desire for how best to battle the aquatic invasive, a public meeting will be held at 6 p.m. Tuesday, Feb. 19, at the Nikiski Community Recreation Center. Aquatic invasive plant expert Dr. Lars Anderson, from the U.S. Department of Agriculture Agricultural Research Service and University of California Davis, will also be present to explain the ecological dangers present by elodea. For more information on the meeting, call 262-5824.